Case makers who aren't "invited" by Apple ahead of time are scrambling to put forth and market their latest protection for Apple's third generation iPad. Within the last two years, bamboo has come out and become one of the most sought out materials to form, mold and be perfected. From bicycles to cases, it's life has changed dramatically and has been creatively sculpted to fit our needs. Here, in the video below, we see the latest by Grove. Check out the awesomeness! Grove Bamboo Case for the new iPad from Grove on Vimeo. The Grove Bamboo Case (iPad 3) is priced at a statement $139. Conceived and made in America from 100% solid Moso bamboo (meet the team here), some will admit that it's a steal. On a side note, a $20 discount is available through the end of March so by now and you'll be toting Apple's latest and great with the sense of environmental friendliness. Be responsible and be at peace. I'll admit that it does seem a little steep, but these guys from Portland are top notch! They even give you the peace of mind that what the use "is not the bamboo that pandas eat." Disclaimer: No, I haven't ordered one yet but I'm really thinking about it. For now, I have a Zagg Folio in "carbon fiber inspire design" heading my way. The keyboard was a closer on this deal. Here's the latest commercial from Apple debuting latest iPad. An amazing screen to say the least! I can't wait. Temperature and humidty monitor, high resolution video with night time mode, 4x zoom, pan & tilt camera, active sound warnings, two way microphones so that you can talk or sing to you baby, and even an interactive color changing night light!!! Withings has introduced a truly amazing "MacGuyver" monitor but I'll admit, $299 isn't that peachy. It actually puts it at the top of the baby monitors in terms of price. Yes you can argue that this feature set is second to none, but let me ask, are you willing to pay for this? I want to think that I am, but it's not the spontaneous purchase that I thought it would be. At $199, I'm all in! Peep the sample video below and tell me what you think. There is one disturbing feature that I read on the Withings website though and it talks about the ability to monitor outside the network. It beings up the question, are you streaming to their server? Why would I have to pay to connect to my home network? Here's the exact text below. The Smart Baby Monitor allows you to monitor your baby everywhere with an unlimited range and for an unlimited time. When you are outisde of home Wi-Fi network, audio/video streaming is free for 15 minutes a day. We propose services upgrades so that you can buy 100 minutes of audio/video streaming for 4.99 euros (in-app purchase by Apple). Sprint customers with iPhone can now watch free live TV and video-on-demand with the Sprint TV App, available now on the App Store. The Sprint TV App, powered by MobiTV, includes free live news and sports, along with shows from popular content brands such as ABC, CBS, NBC, ESPN, The Disney Channel, MTV, Comedy Central and more. Click here for the FREE APP! It's amazing how you can think of something you need, search the Apple iOS App Store, and viola -- free for a limited time, I give you the Tabata Timer by Garaio Technology Lab. Hanging out in Miami for a quick two day stint, I found a quick start solution with some WOD (Workout of the Day) strategies. Downloadable and printable in PDF format, Michael Ashcroft maps out a 16 day strategy and I got Jojo to do it up with me. Day 2 was all about Tabata workouts and it always helps with a timer. Download it now! It does exactly what it states and best of all, it's free! Sometimes, the interesting things are already spoken about, read and filtered. Sometimes, you run into interesting things that are worthy of an individual post and are lazy. Every now and then, you might find yourself energized with an idea but then get lost in the writing. So, I decided to start here. For those with an Apple computer, i.e., Macintosh, you may have now noticed the Apple Key down on your keyboard to the right or left of the spacebar. Look for it. If you don't have it, then you probably bought into the Apple side of things post 2007 when the keyboard was redesigned without it. In place, "command" was written. But that little symbol accompanying either the former or the latter, what the heck do we call it? Enter a story found on folklore.org, "Swedish Campground"
In another story, a famous blogger named Dan Frommer launched his adeptly named blog "Splat Eff" back in July 2011 further enlightening readers about the symbol. Check out what he says here on, What does SplatF mean? 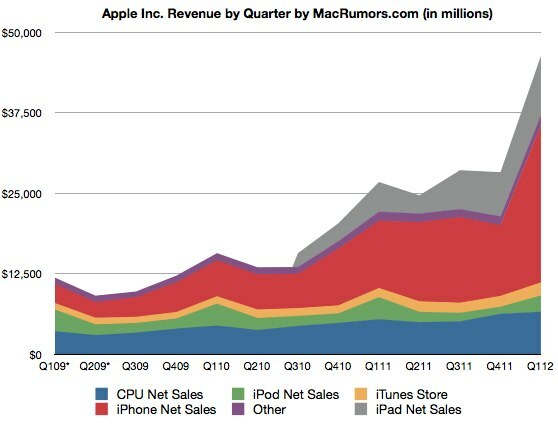 Look at this graph from macrumors! EXPONENTIAL! Bullets from Matt Richman's "takeaways" from Apple's (Q4) 2011 earnings. With a record $13.06 billion in profits, it was Apple’s best quarter ever — by far. Apple has sold more iOS devices than Android devices combined. As always, the haters will always hate, but the numbers speak for themselves. Congrats to the team and here's to an amazing 2012! Can't wait for the iPad 3 and the iPhone 5 and my new Macbook Pro! It's going to be a costly 2012 all around! How do you Program an App? If you've been having trouble realeasing your first iPhone app or any iOS app for that matter, grab some inspiration from this guy! Watch in awe how sixth grader Thomas Suarez presents at TEDxManhattanBeach about how he first started developing iPhone applications. What have you done today!? Here it is, my 32GB White iPhone 4S on AT&T vs. my mother-in-law's 16GB White iPhone 4S on Sprint. The location is San Diego and the video is crappy (so sorry). I rushed this to the internet and will try to upload better quality videos later. This was shot on my Canon S90 in low light. Testing the new iPhones in San Diego, California, I have two brand new iPhone 4S working on their perspective networks, AT&T and Sprint. Both caches, cookies and histories were erased and I loaded up Briam Lam's The Wirecutter and from there navigated to various parts of the site (MacBook Air Review) as well as load up a link to Jason Snell's MacWorld Review. Will You Talk to your iPhone?! Some friends of mine are adamant that they will NOT talk to their iPhone because it's just plain stupid, especially in public. Watch this video and tell me what you think!? Will you talk to your iPhone? I know I'm contemplating it. Have an iPad 2 yet? Apple just posted a new iPad video demonstrating the diverse uses of the iPad 2, and it's awesome! Entitled "Now," after watching the commercial, we all can expect that life from this time forward will be different and done on an iPad. (not a Galaxy Tab =) ) If you haven't succumb to buying the latest and greatest tablet computer from Apple, watch this commercial and tell me you don't want one. I know I do. Ever since selling my iPad one a little prematurely last November, I've been itching for a new tablet. You ask why I haven't bought one yet...it's because I'm waiting. I'm waiting like I always do when it comes to tech toys but be rest assured, I'll be in line or online at day 0 for the iPad 3. Seven months ago, I made my first big electronic purchase EVER, a new MacBook Air. After years of hand-me-downs from my husband (1 custom desktop, 1 HP dv1000 laptop, and an IBM T43) I was definitely overdue for a new computer. The last laptop I was used was the world’s heaviest and bulkiest laptop that did the job, just not fast enough. I didn't know what flash storage was, unibody construction and all that fancy mumbo-jumbo but I knew that it was pretty. Note: I was only familiar with Mac OS X from using my husband's MacBook Pro or his previous Titanium. I love that my Air is so lightweight, fast and of course, pretty! My laptop is portable enough to slip it into my work bag with room for everything else I need. It's so fast that I can just open it up and pick up right where I left off. And you can’t mess with the overall look of the Air. It’s so modern and sleek, but still maintains a classic look with a full sized keyboard & Apple's Multi-Touch Trackpad. As far as my transition from the PC world to the Mac, it was pretty smooth. Being a forever student and knowing papers had to be done, I didn’t know how I would fare with Apple’s version of their word processor names Pages. After a few frustrated calls to my husband, I was able to get through a few documents and familiarize myself with the general layout. Although I still prefer Microsoft Word, Pages is quite intuitive and user friendly. My MacBook Air was definitely a smart purchase and has officially converted me to becoming an avid Mac user. Now I hear that they are going to update it already? Boo. My specs of the one I bought are: 13" 2.13 Intel 4GB RAM 256GB flash storage. The highest model in the bunch and I love it! You can watch my unboxing here! After nine excruciating months, Apple has finally gotten the right mix of materials in order and has released the once mythological, almost classified as vaporware, white iPhone 4! To think that I almost waited this long for the white version?! Yes, I still want the white iPhone 4 so I'm also willing to say that I'll trade anyone with buyers remorse for my 32GB black iPhone 4 so just drop me a line but back to the facts. Selling for the same price as the black iPhone 4, you'll get the same device albeit with some minor changes to the proximity sensor as well as a purported minor increase in thickness?! Although not mentioned or re-specified by Apple, these new white Apple iPhone 4s should fit all cases alike and in celebration, we're going to give away two brand new awesome iPhone 4 cases! From left to right, check out the Scosche bandEDGE g4 or the Casemate Horizontal Hipster with Black Lining both made for the iPhone 4 GSM. I believe that they should also fit the Verizon / CDMA variant but unfortunately, I cannot guarantee that it will. Any who, why not just enter cause it's a freaking free giveaway? No you don't have to own the white iPhone 4 to be elegible or even own an iPhone 4. All you have to do to enter is to tweet this website and mention the giveaway, leave a comment or post / writing a blog that leads back to this post. If you do all three, you receive three entries! (I loved the method that Ray Maker uses on his DCRainMaker Blog that I thought I'd incorporate the same methodology so here it is!) Just make sure to tell me how how many entries you've entered in the comments below and I'll be sure to give you all the credit. Entires are required to be in by Saturday May 7th, 2011 at 11:59PM Pacific and goodluck! The title says it all. As of this morning, March 11, 2011, you can order either the black Apple iPad 2 (ships within 3-5 days) or the white Apple iPad 2 (ships in 5-7 days) along with Apple's Smart Cover and free engraving on http://www.apple.com. While you're at it, pick up AppleCare for $79.00, add-on the Apple Digital A/V Adapter for another $39.00, and why not add in the digital camera connection kit for $29. Checking out, my cart easily shot up to $815.00 for a 32GB Wi-Fi + leather Smart Cover, and the rest I spoke of above! You give it a shot and tell me how you did. "Again, you can't connect the dots looking forward; you can only connect them looking backwards." "Sometimes life hits you in the head with a brick. Don't lose faith." "Stay Hungry. Stay Foolish." Watch and be truly inspired! Do something that you believe in to be truly amazing today. In its entirety, Steve Jobs' 2005 Stanford Commencement Address also know as the "Stay Hungry. Stay Foolish. Speech"
You can check out the full text of Steve Jobs' Commencement address here. I've been using Sparrow for a little over 5 months in beta and today, Sparrow has launched it's veritable 1.0 for $9.99 on Apple's Mac App Store. Primed for Gmail centric users, 1.0 takes the look and feel of the browser translating it to an app that closely resembles Twitter's Mac client (formerly known as Tweetie for Mac.) A joy to use, it's robust interface easily replaces what Apple's Mail client lacks. While still lacking IMAP support for other providers, Sparrow is readying version 1.1 converting it to a full-featured mail client that will be compatible with other IMAP services. Download it today and change the way you communicate! @splee Yes, Sparrow Lite has been submitted at the same time than Sparrow and hasn't been reviewed yet by Apple. In all it's glory...suspense, anticipation...the Verizon iPhone...Commercial! Are you going to buy it, switch over on February 10th or just wait it out to see what Apple has up it's summer sleeve?! Biggest news is that the Verizon iPhone 4 will double as a WiFi hotspot allowing for 5 devices to connect and use up the 3G CDMA data. Other than that, normal pricing coming in at $199 for 16GB and $299 for 32GB all coming out on February 10th. Let the madness begin! Oh yeah, by the way, if you are already a Verizon Wireless customer, you can pre-order on February 3rd. No signs of the white iPhone but apparently it will have VZ Navigator and VCast pre-installed.